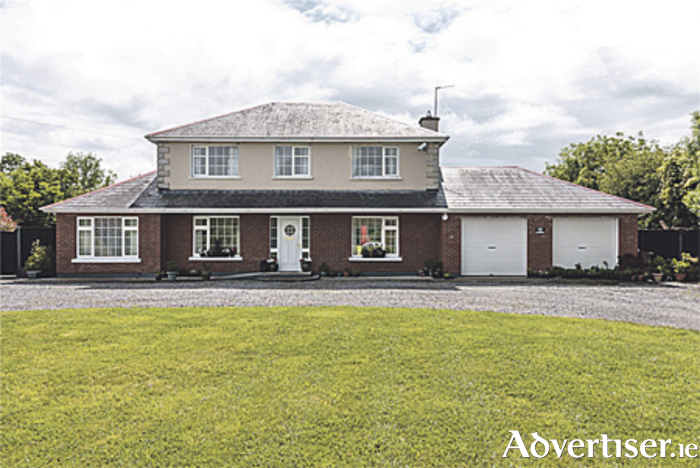 Built in the tradition of a country home in 2004 and sitting on a one acre site with mature landscaped gardens, this home in Brackagh, Moate, offers all the requirements of modern family living. With living accommodation extending to 1,700 square feet, the interior of the home boasts five bedrooms, one reception room, four bathrooms, central heating, and attractive decor. The exterior offers a double driveway and a spacious garage with ample room for private parking. The home is approximately 165 square metres with a BER C3 energy rating. The property offers convenience being just 15 minutes from Athlone town, five minutes from Moate, and four minutes from Horseleap National School. For more information call agent Helena Kenny of Sherry FitzGerald O’Meara on (086 ) 8119190.